The 1955 Ford Thunderbird celebrated it's 50th anniversary in 2005. 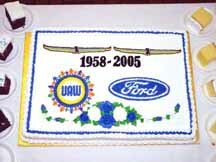 Ford celebrated it with the 2005 Thunderbird. This is it, this is the last of the Thunderbird. On June 30, 2005, the last Thunderbird was making it's way down the production line at Wixom. That day, any employee of the Wixom plant that had worked on the Thunderbird were signing this last Thunderbird, destined to go to a member of the Ford family. Autographs were made on the inside fender panels according to Adrian Clements, including a couple by him. Officially, the car was completed on July 1, 2005 though there is data showing that it's recorded build date is July 25. It's vin# is 9337, the highest VIN number assigned to an 05 T-bird. Interesting to note is that the last 3 Inca Golds were also completed on July 1. 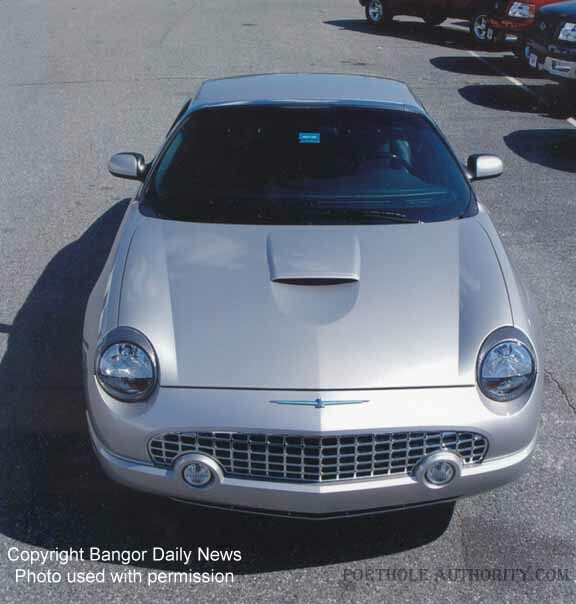 The color of this last Ford Thunderbird is called Platinum Silver and has the black accent interior. This data has been verified thru records. There will be some controversy though as Ford released another photo of the so called "last Thunderbird"; a picture that was taken on July 1 in the early hours of the work day. This photo shows a Cashmere special edition however it happened to be in the right place at the right time but not the last t-bird on the line. The following will cover the real last Thunderbird. I'll include later on the page, pictures of the Wixom "last T-bird" ceremony, and the picture of the very last Thunderbird built. Above is the inscription on the trim above the glove box of the real last Thunderbird, at least for this era. ELLSWORTH, Maine --The last Ford Thunderbird ever built was delivered to a Ford family estate on Mount Desert Island on Friday. The sleek, silver convertible was one of 1,500 special collector's editions made by Ford Motor Co. this year. It rolled off the production line in July. "People are saying, 'I can't believe it's the last one,'" said Dave Gould of Dave Gould Ford, which took receipt of the car Friday morning. "Everyone knows it will be worth a ton of money someday." The car was made for Josephine Ford, the granddaughter of company founder Henry Ford. But the 81-year-old heiress, who owned a summer home in Seal Harbor, died June 1 in Detroit. The two-seater car instead went to her daughter, also named Josephine. 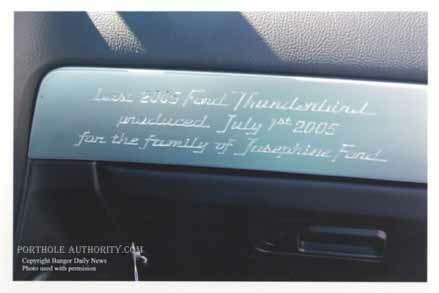 An inscription on the dash reads: "Last 2005 Ford Thunderbird, produced July 1st 2005 for the family of Josephine Ford." The custom-made car has a 290-horsepower V-8 engine, and is considered priceless. The Thunderbird, one of Ford's most celebrated nameplates, first went on sale in 1954 and soon became part of the American culture. The Beach Boys sang about the "T-bird" in 1964, Suzanne Somers drove one in the 1973 film "American Graffiti," and Susan Sarandon and Geena Davis took one on a cross-country crime spree in the 1991 movie "Thelma and Louise." The Thunderbird went through numerous design changes over the decades before going on hiatus in 1997. The redesigned 2002 Thunderbird got off to a roaring start when it was brought back into production, but the flurry died down almost as quickly as it emerged. After sales fell to just 11,998 last year, 33 percent fewer than in 2003, the company announced it was retiring the car this year. Dave Machaiek, curator at the Owls Head Transportation Museum, said it's special for the last T-bird to be in Maine. "It's the end of the era," he said. The museum, located in Owls Head outside of Rockland, is home to a 1955 Thunderbird with black-and-white seats. The Thunderbird was Ford's sport response to Chevy's muscle car, the Corvette, Machaiek said. "They are an icon of the `50s," he said. Photos were supplied to me thru a friend by http://www.bangornews.com/ for exclusive use on this website. If you must, just post a link back to this page. Photos are under Bangor Daily News and the photographer's copyright. With the significance of the Ford Thunderbird as an icon for Ford Motor Company, there had to be a ceremony commemorating the last day of production at the Wixom plant for the Ford Thunderbird, at least for this phase of it's life. Released by Ford was the photo below of that ceremony. The event took place at the beginning of the day shift on July 1, 2005 and a cashmere special edition was used for the photo shoot. The Thunderbird had been built at the Wixom plant from 1958 to the mid- 70's and then again when the 2002 was introduced.